The Sixth Extinction draws on the work of scores of researchers in half a dozen disciplines–geologists who study deep ocean cores, botanists who follow the tree line as it climbs up the Andes, and marine biologists who dive off the Great Barrier Reef. 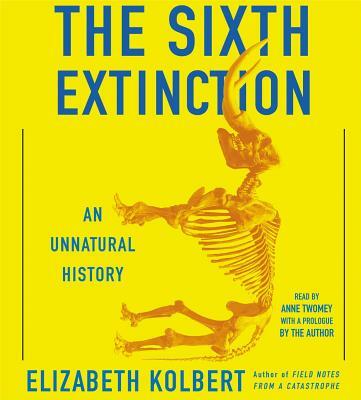 Elizabeth Kolbert, two-time winner of the National Magazine Award and New Yorker writer, accompanies many of these researchers into the field, and introduces you to a dozen species–some already gone, others facing extinction–that are being affected by the sixth extinction. Through these stories, Kolbert provides a moving account of the disappearances occurring all around us and traces the evolution of extinction as concept, from its first articulation by Georges Cuvier in revolutionary Paris up through the present day. The sixth extinction is likely to be mankind's most lasting legacy; as Kolbert observes, it compels us to rethink the fundamental question of what it means to be human. Elizabeth Kolbert has been a staff writer for the New Yorker since 1999. Prior to that she was a reporter for the New York Times. She received the American Association for the Advancement of Science's magazine writing award for the New Yorker series on which this book is based. She lives in Williamstown, Massachusetts with her husband and three sons.